In addition, all of Samsung's high-end SHUD TVs sold next year will be able to act as a hub for its SmartThings platform, meaning the TV will be the controller for things like lights, thermostats and door locks. That could save people having to buy a standalone SmartThings hub for $99 - though SHUD TVs are quite pricey. The SmartThings Hub with a number of sensors. The announcement comes a week before the giant CES gadget show in Las Vegas, where all the big electronics manufacturers are expected to show TVs, washing machines and other home appliances that can be networked together. With an outdoor camera connected to the TV, for instance, you'll be able to see who's at the front door without getting up from the couch. Motion sensors could flash an alert on the TV screen if someone's prowling around the garden. It's all part of the electronics industry's latest push to get you to go out and buy new products, though how many people will embrace the idea remains the be seen. There are several protocols and platforms vying to link the smart home together. 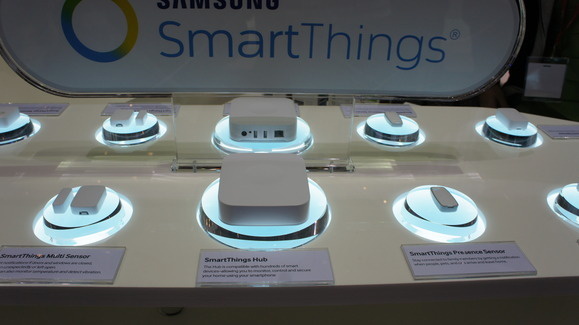 Samsung acquired its SmartThings platform when it bought the startup that developed it last year. Samsung says it's an open platform, meaning other manufacturers can use the technology in products. It says there are 200 compatible products on the market in addition to those from Samsung. While all of its SHUD TVs with ship with SmartThings technology inside, the functionality will be "activated regionally as SmartThings expands its platform availability," the company said. It didn't provide any more details than that. 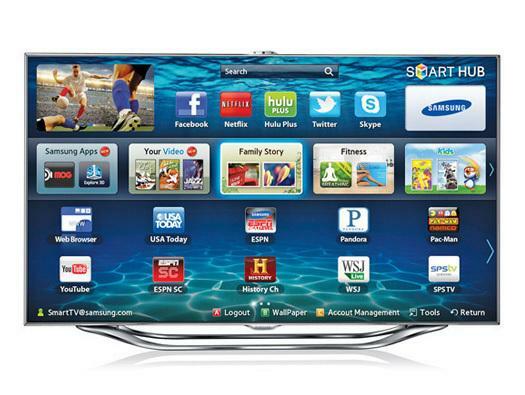 Samsung says its SHUD TVs give superior picture quality thanks to a "nano crystal" technology. The cheapest 60-inch model runs about $1,800 at Costco in the U.S.